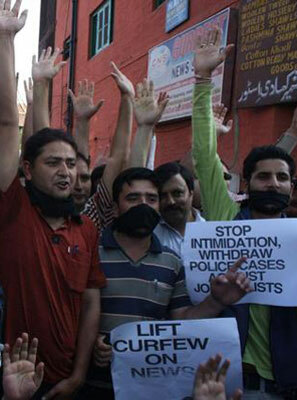 3rd May 2012 was World Press Freedom Day. Whilst international media generally targets the likes of China for their clampdown on ‘sensitive’ programming, it is concerning that India seems to be following close suit. It appears to be becoming increasingly easy to offend the Indian powers that be, and consequently face the reality of censorship or even legal action. Public order – i.e. anything that might upset the public peace – would promotion of the recent mass action against corruption a la Anna Hazare meet this criteria? Sovereignty and integrity of India – i.e. utterances that question the integrity of India. One of the biggest cause of concerns in India with respect to these restrictions is the rise of Internet censorship. Recently, Member of Parliament P. Rajeeve introduced in the Rajya Sabha a motion calling for the Intermediary Guidelines Rules (aka Internet censorship law) passed last year to be annulled. Should this motion not receive the support of the majority of both Houses and be passed, the consequences to freedom of expression in India would be dire. Already, India has witnessed multiple cases of abuse of the free speech laws, especially through the Information Technology Act. Evidence includes the forced removal of CartoonsAgainstCorruption.com, the arrests of M. Karthik, a young Hyderabadi atheist, and of Prof. Ambikesh Mahapatra for allegedly ‘defamatory’ cartoons of Mamata Banerjee. Make no mistake, internet censorship is not a new thing in India. Even in the mid-90’s, certain websites were blocked through executive order. In 2008, the Information Technology Act was amended to increase transparency but there is still significant evidence of extra-legal censorship (this can be effectively measured by observing the disparity between Google censorship statistics and the official government stats). The current censorship rules remain in place since April 2011, despite much protest from various champions of free speech including individuals like P. Rajeeve, Rajeev Chandrashekar, and Kumar Deepak Das, as well as organisations like Google India and Software Freedom Law Centre. These censorship rules allow for any person or organisation to get content removed from the Internet within 36 hours by simply requesting an intermediary like Google, Facebook, Rediff, etc. to do so. The content provider would be obliged, with zero recourse to any challenge, to remove the content. Once again, internet censorship was made as unaccountable as it was before the 2008 amendments to the ITA – the only difference is that now, the power to censor lies in public hands, and is not just the remit of select state officials. Following a media backlash, the censorship rules are currently under review but the spate of lawsuits effectively promoting censorship indicate that India has still not found its way forward. Press censorship has had a particularly negative impact to those in the arts. The examples are plentiful: from the banning of Salman Rushdie’s The Satanic Verses in the late eighties, to the recent gagging of political cartoonist Aseem Trivedi for treason because he was inspired by Anna Hazare’s anti-corruption movement and took to ‘insult’ India’s national emblems in his illustrations. Couple this with increasing politically motivated news censorship and shocking statements like the judge in the Delhi high court warning that: “Like China, we can block all such Web sites”, in reference to the likes of Google and Facebook, it is clear that the world’s largest democracy may be straying from its path when it comes to freedom of expression. Stay tuned for more editorials covering poverty in India, the legacy of large sporting events like the Commonwealth Games in Delhi, the legality around Indian online gambling and reviews of new sites that allow people to buy lotto tickets online from India. B24 will also be producing a series of articles on disability in India, the stumbling blocks to economic growth and overtaking China. Until then, thanks for reading and we congratulate the efforts of all those working toward improvements for a free press in India.